Integrated leak-proof sump can safely contain any chemical spillages. Compliant with COSHH, Health and Safety Guide HSG51 and DSEAR 2002. Robustly constructed steel cabinet with reinforced doors - features an anti-bacterial protective powder coating, yet is also smart and professional in appearance. Single point lock with chrome door handle, ensuring extra security for your hazardous materials. Supplied with GHS conforming 'Harmful/Irritant' COSHH exclamation mark label. Additional COSHH labelling supplied loose, including 'Health Hazard', 'Acute Toxicity', 'Corrosive' and 'Aquatic Toxicity' labels. Compliant with hazardous material storage, as classified by CHIP and the CLP regulation. 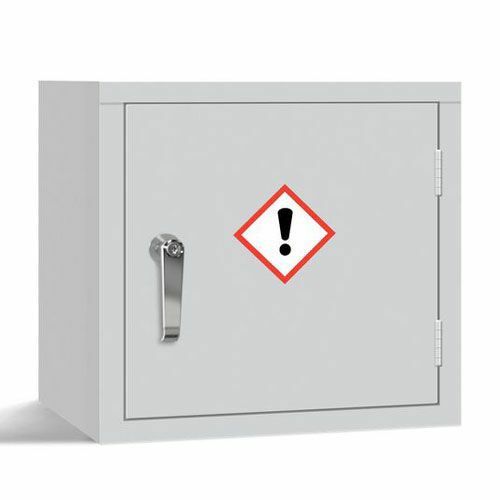 Hazardous storage cabinet fitted with 1 shelf, to safely store your chemicals and COSHH materials.